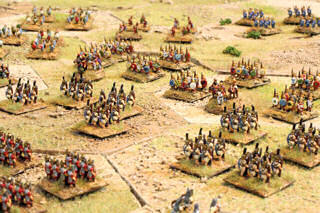 If you are expecting actual photos of the Battle of Zamabetween Rome and Carthage in 202 B.C., you have been misinformed.What we have here are photos of some 6 mm Baccus miniaturesrecreating the battle according to Richard Borg'sCommands and Colors Ancients game.Cards are used to march the combatants across the board.Dice are used to resolve battles and destroy or drive back the enemy.Each infantry unit has 4 stands. 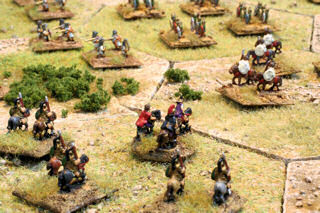 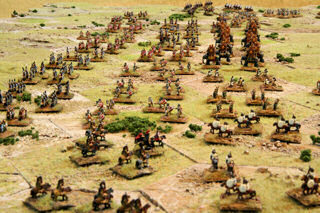 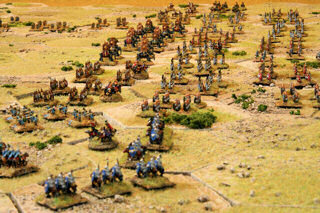 Each cavalry unit has 3 stands.When 6 enemy units are destroyed, a victor is declared and the battle ends. 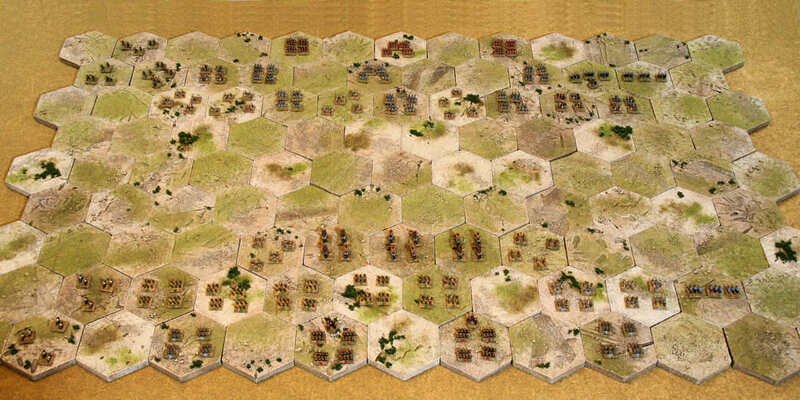 The photo above shows the opposing forces at the start of the battle:Rome at top and Carthage at the bottom.The game is played on a 13 by 9 hex board modeled here withGHQ Terrain Maker terrain hexes.With these 4 inch (10 cm) hexes (measured flat side to opposite side), the complete board is 52 inches (130 cm) wideby 36 inches (90 cm) deep.The photo at right shows the Carthaginian auxilia and elephants ready to attack the Romans. 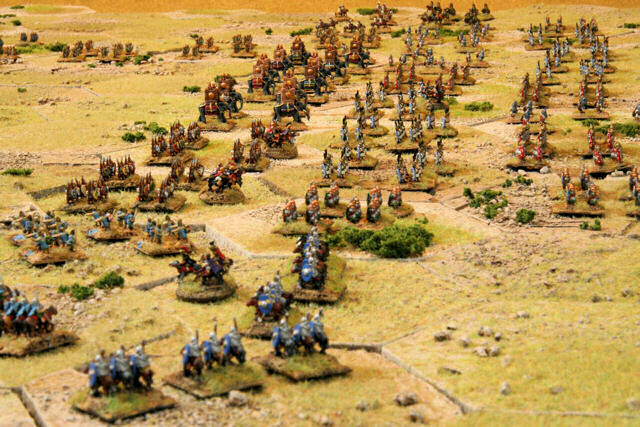 The battle is joined.The Carthaginians on the right have met with the Romans on the left.Roman cavalry on the flanks have marched forward to meet the Carthaginian flanks.The light horses are pelted by slingers and javelins. 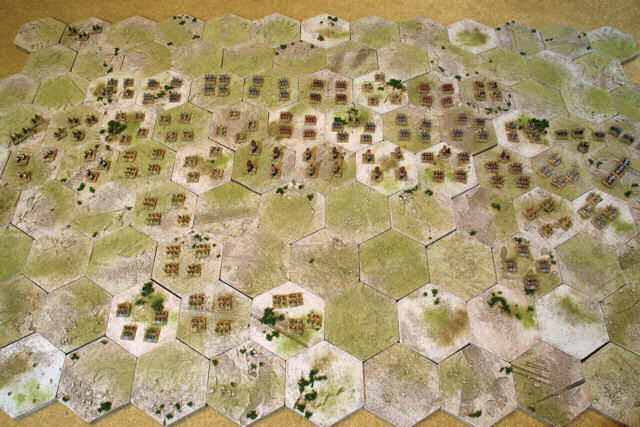 This view is from our eagle-eye perspective.The Romans attempt to wrap around the Carthaginian flanks.The Carthaginian auxilia lag behind but move forward to join the line. The Carthaginian elephants hurl themselves against the Roman infantry line.The men in the forecastles hurl missiles down upon the enemy.The elephants push and trample the infantry.The infantry hold tight and slash back at the elephants. The Carthaginians are outnumbered.Roman hastati, princeps, and triarii push forward and engage Carthage's best infantry.Hannibal and Hasrubal lead the troops from the front.Both sides cause tremendous casualties. 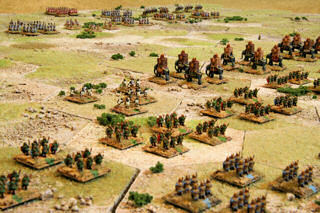 Masinissa leads the Roman light cavalry into Carthage's left flank.The Numidian light cavalry reel from the flank attack.Velites with their wolfskin headgear hurl their javelins at the opposing auxilia. On the Roman left flank, medium cavalry charges forward to battle with wild Carthaginian warriors.The warriors are ferocious in battle, but quick to run when they are injured. 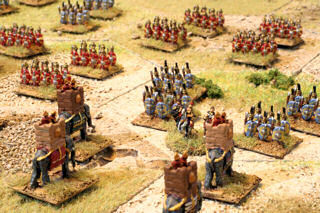 Roman general Laelius hits hard into the flank of the warriors.But he himself is charged by Carthaginian medium cavalry.Will the Romans break and run?Or will they stand and turn the Carthaginian flank? 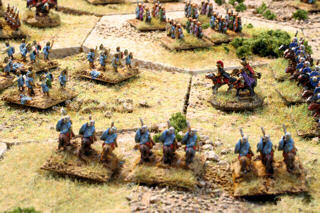 Thanks for visiting and reading about my Commands and Colors Ancients figures.More miniatures-related articles are atDan Becker's Miniatures and Models siteor go directly to my6 mm Carthaginian Army,the GHQ terrain preview,or the6 mm Roman Army pages.Other good sites for information on this great game areJohn Foley's CCA site,Board Game Geek's CCA pages,and the Yahoo CCA Vassal group. 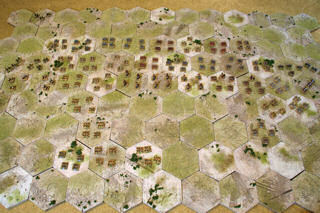 Last modified: Thursday, 09-Jun-2011 12:54:10 MST.